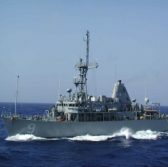 Global, a 1st Flagship subsidiary, has received a potential five-year, $32 million contract from the U.S. Navy to support vessels assigned to the Naval Sea Systems Command Inactive Ship Maintenance Office and the Guided-Missile Cruiser/Dock Landing Ship Modernization Detachment. The Defense Department said Friday that Global will help inspect, survey, maintain and dispose of vessels at the two facilities as well as conduct electrical, mechanical and structural repairs on the ships. The contract’s one-year base period is valued at $7.3 million and will run through June 2018. The service branch received five bids for the contract via an online procurement and obligated $3 million in fiscal year 2017 operations and maintenance funds at the time of award. The company won the contract via an online competition that received five bids. Global will perform work in Philadelphia, Pennsylvania and Norfolk, Virginia through June 2018. Global offers cloud computing, contract management, education and training, environmental response, facilities management services, human resources management, information technology support, logistics and professional administrative services.